Life can take us to unexpected places, as Ebenezer Scrooge and I have both found out. Fifteen years ago I was the newly minted author of The Cynic’s Dictionary. Now I’ve started volunteering Wednesday mornings in my son’s first grade class. First grade teachers need all the help they can get, and so do first graders. Besides, I’m happy to look over the students’ little shoulders and offer my writerly wisdom as they grapple with the conundrums of English spelling and pronunciation. 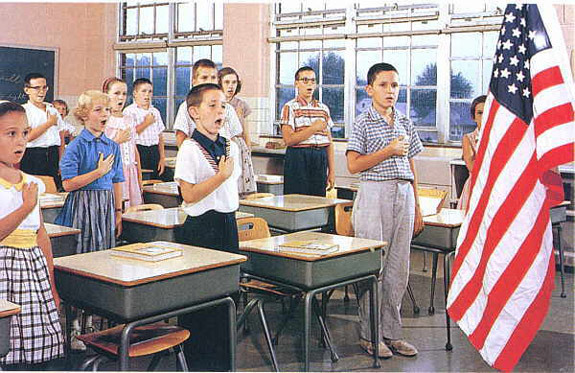 Last Wednesday, as the teacher called the class to order, I experienced one of those rare and mysterious time-warp moments: decades suddenly vanished and I seemed to be back in grade school myself, reciting the Pledge of Allegiance along with the class. There it was: the same sing-song delivery by a chorus of juvenile voices… the same pauses after every couple of words… same setting, same flag — everything looked, felt and sounded remarkably familiar. Memorable words, originally penned (in slightly different form) by a Christian socialist named Francis Bellamy, back in 1892. Of course, the average grade school student is hard-pressed to tell you exactly what those words mean. I fondly remember one of my classmates asking who Richard Stanz was. (“… and to the republic for Richard Stanz…”) For that matter, I can remember wondering why our republic was supposed to be invisible. I have to tell you that reciting the Pledge of Allegiance during a time of national discord, all these decades later, was a sobering and enlightening experience for this post-grad grade schooler. I was fortunate to have grown up in a more innocent age, when it seemed that we actually were one nation, indivisible. Yes, the South still had its issues, and most women still labored on the domestic front, voluntarily or not. But during those blissful Cold War years, before JFK’s assassination and the upheavals of the late sixties, you sensed that we were all part of the same youthful, great and noble enterprise — the land of the free and the home of the brave. What on earth happened? How did we get from there to here, from “one nation, under God, indivisible” (whether God actually reigned above us or not) to the sad, battered and fragmented patchwork of feuding special interests that is America today? I’m convinced it all started with my generation’s noisy coming of age during the Vietnam era: the baby boomers’ headlong rush to overthrow parental (and especially paternal) authority… the snarling contempt for our leaders in particular and authority figures in general… a pervasive loss of faith in old-time virtues and values… and, disturbingly, a creeping intolerance for anyone who dared to deviate from one’s deeply held (and undoubtedly correct) view of the cosmos. We’re still suffering from our ’60s hang0ver forty years later. The rise of that youthful counterculture — a culture now essentially confined to New Age crystal shops and alternative-medicine fairs — ripped the fabric of American society from one end to the other. Suddenly it became acceptable for other, more specialized subcultures to rise and thrive and exult in their differentness from mainstream society: I like to think of this phenomenon as the boutiquification of American culture. Today those boutique subcultures have essentially declared independence from America. Countless blacks, Latinos, Native Americans, gays and feminists have pledged allegiance to their own separate communities, from which they tout their specialness and push their various agendas. Fundamentalist Christians, Fox fanatics, gun nuts and mad-as-hell Tea Partiers are stirring rebellion on the right… privately educated NPR progressives and their organically inclined ilk sneer at the proceedings from the left. And of course, the plutocrats who pull the strings are a subculture unto themselves. They quietly funnel our former wealth into their silk-lined pockets and hope nobody notices. Even our linguistic unity has been compromised by the rise of Spanish as a second language within our borders. The splintering influence of identity politics has replaced “one nation, indivisible” with “my people, right and wronged.” Everyone seems angry, insular, eager to take offense, and ready to sock unbelievers in the eye. It’s all about “me, me, me” and not about the greater US. United States… remember? Or has the concept already faded into history, like Red Skelton, Bosco and Lucky Strikes? As my son’s first grade class recited the pledge, I felt strangely and movingly connected to a lost ideal of American togethernesss. Is it gone forever? Will these first graders stop to think about what the words of the pledge actually mean — despite their understandable confusion about Richard Stanz? I hope so. Maybe my son’s generation will finally repair the damage unwittingly inflicted by my own generation forty years ago. Then again, maybe not. I’d like to remain idealistic, but something tells me I should be writing a second edition of The Cynic’s Dictionary. The irony of the 60’s counterculture was that it was meant by participants to throw off the vested interests and make a revolution bringing people together (peace and love), to celebrate and prize individuality. We saw the corporate, governmental world as subjugating the contributions of each person (which it does). Unfortunately, opening up room for diversity made for a splintering of goals, and polarization of political thought. But the sad fact is that political special interests have always been with us and backroom deals with big money brokers is the norm, since the nation was founded. Richard Nixon’s fall brought the optimism of the 60’s to a close – the President, who was still a revered individual until then, became just another crooked politico. So Beaver had to grow up suddenly. And so we can’t return to knowing with certainty who is right and who is wrong. We who started the revolution for change got more change than we expected..
Bill: In my humble opinion, we somehow discarded all that was best about the counterculture (the sense of adventure and romance, the freaky humor, the love, the passionate sense of justice, and the relaxed-but-colorful approach to life) and kept what was worst about it (the self-righteousness, political fanaticism, sloppy morality and intolerance toward those who don’t get with the program). You’re right that the counterculture’s original spirit of freedom and experimentation opened the door to all our current splinter groups with their separate demands and allegiances. And that’s a shame. Yes, we had special interests in the past (notably the robber barons and the unions), but they didn’t think of themselves as separate from America, the way today’s special-interest groups tend to do. The decline of the presidency as a revered office began with LBJ (Remember “Hey, hey, LBJ, how many kids did you kill today?”) and crumbled even further with Nixon. Subsequent presidents have done little to restore its luster. I hear you, Bruce! Most Americans aren’t even aware that they’re now living in the CSA.